My Docs Online FAQ » MDO file – what is it and what do I do with it? MDO file – what is it and what do I do with it? If you are seeking information on the “.mdo” file you are using the Download Assistant by clicking “download” in the “Old” Web Client (see this article to tell which you are using and the differences). The Download Assistant has been retired and replaced by the Desktop App and by the new web client’s built-in “Download as Zip” feature. The Download Assistant (Windows) uses a special file with the extension “.mdo” as part of the download process. the file association of .mdo with the Download Assistant is set when the program is installed. 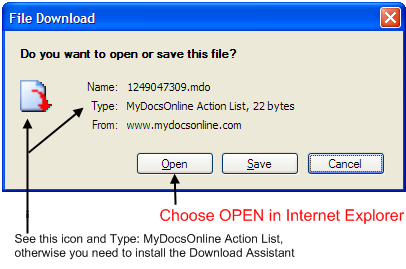 The Download Assistant must be installed before you can use the “Download” button in the web browser interface (log in at www.mydocsonline.com). When using the Download option you must OPEN the mdo file – it contains a “list” of the files selected for download, and launches the Download Assistant, which then asks you where to put the files. If the icon and file type doesn’t match what is shown above, you need to Install the Download Assistant.